AMMONNEWS - Minister of Foreign and Expatriates Affairs Ayman Safadi met, yesterday, in Washington United States National Security Advisor John Bolton and a number of senior U.S. administration officials. The two sides discussed bilateral ties, as well as, the latest developments in the Middle East region. Safadi briefed the officials on economic challenges facing the Kingdom, repercussions stemmed from regional crises, and Jordan's efforts to promote its economic performance. The Palestinian cause, Syria and Iraq's fight against terrorism were figured high during the meeting between Safadi and Bolton. 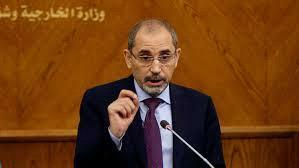 Safadi also took part during his visit to the United States at a ministerial meeting of the Global Coalition To Defeat Daesh, and the Syria small group meeting. During a panel session, organized by The Washington Institute for Near East Policy, Safadi spoke about Jordan's stances towards regional developments and the Kingdom's efforts in improving its economic performance.